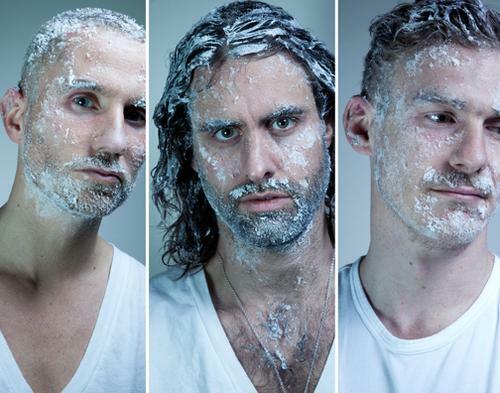 This is Miike Snow, a Swedish band formed only a couple of years ago in Stockholm. The band consists of American singer / songwriter Andrew Wyatt, and composers/producers Christian Karlsson and Pontus Winnberg, also known as Bloodshy & Avant. Karlsson and Winnberg share a common background as DJs but they really came to public knowledge through their collaborative work as producers for such artists as Kelis, Madonna or Kylie Minogue. The combination of their producing talent and Wyatt’s solid background as a songwriter, bassist and singer gave birth to Miike Snow’s quite unique electro pop sound. The first single taken off their 2009 self-titled debut album was “Animal”. This track was remixed by Fake Blood to great effect and it became a massive club banger! The band supported Lykke Li on her first headlining tour and now they’ve decided to hit the road too. They will be on tour all through October and November. For tour dates, check out their page on MySpace.